History of Sailing Yacht Masts, Rigging and Sails: 1900-Present day. The design, construction and materials of masts, rigging and sails have changed greatly over the course of the 20th century. From solid wooden masts built from a single tree to carbon fibre sections aerodynamically tested, super light and super strong. For sails there have been developments from natural materials such as cotton, which had a tendency to rot and stretch when wet, to new materials such as North sails 3DL sails using Vectran, carbon fibre, Kevlar and exotic films and glues. This report will be looking at the history of these developments and the technological advances necessary for these developments. The Rig is the powerhouse of a sailing boat. Through the development of new rig materials and technology efficiency and reliability of the rig can be increased. This leads to yachts becoming faster. In the second half of the 19th century yacht racing was borne as a sport. Initially events such as the America's cup were started, this type of racing lead to the development of measurement and handicap rules. Thus begun the development of racing boats to push the boundaries of these rules. Significant improvements in performance could be found by the development of better rigs. Since the beginning of this century there have been a number of developments in materials and manufacturing, from the use of cotton sails and wooden spars at the turn of the century to the Carbon rigs and cuben fibre sails found aboard the new breed of yachts. The aim of the designer and manufacturer is to find a compromise between all the aims above with the materials and technology available. New technologies and materials are usually seen first in the development classes, such as the international 14's and international moths. These technologies tend to trickle down into other classes with time. In yachts new developments are usually first developed and tested for yachts competing in the top of the sport. The most expensive and radical developments are found in America's cup yachts. This has been a source of most new technological developments sine the cup first started in 1851. Technological developments are slow to become accepted in the one-design classes, the requirements for a one design class is for a equally matched yacht and also to keep the costs down of buying and maintaining the yachts is an important consideration in the choice of materials and construction of the rig. Part 1: Mast Materials and Manufacturing. There have been 3 main developments in the materials used masts. The main developments happened in the following order: wooden, aluminium, and composite mast materials. Although at present all these materials are still used in yachts and dinghies but only carbon fibre is used in high performance racing machines. It is not a light material, especially in comparison to modern composite masts. Greatest strength is achieved by using a single length of wood. Prone to rot if it is not treated correctly. The problem of greatest strength coming from a single length of wood became important at the beginning of the century in Britain. During the industrial revolution vast areas of woodland were destroyed, for various reasons such as building of ships and for firewood. This meant that the wood required to make masts became harder and therefore more expensive to come by. Wooden masts had been in use for many thousands of years and proved itself as a reliable means of carrying sail. Things changed in the 20th century as boats began to be built solely for speed and racing. The cost of labor and cost of materials compared to the final wooden mast is no longer economic. Aluminium masts in dinghies were 1st seen after the Second World War. They were tried in the development class dinghies such as the international moth and the international 14. There was a relatively cheap supply of aluminium standard foil sections from the aerospace industry, which were tried out in these development classes. The size of the mast that needs to be constructed will largely determine the manufacturing method employed. For simple dinghy masts and small cruisers a standard extruded mast section is commonly employed, these are made by extruding aluminium through a mould. The mast is then chopped to its desired length and the fittings are attached. This is the cheapest form of aluminium mast since it does not require the use of expensive machinery and moulds. The design and manufacturing methods used to make extruded aluminium masts has changed little since the 70's however it is still by far the most popular type of mast that is in use today. For higher performance and larger masts the same system can be employed, Only that a triangle is cut out of the top of the mast ant the space is bent and welded together. 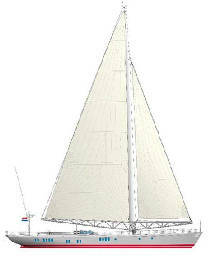 The resulting shape has a tapered top enabling the mast to bend more. The latest development in aluminium masts is the use of Alustartm. This is an aluminium alloy developed for the marine industry. With a 20% increase in the strength of the alloy over other marine grades the plate thickness used can be reduced, therefore reducing the weight of the mast. It keeps its corrosion resistance, bend ability and weld ability of other aluminium alloys in its group. This alloy is available in plate form with which aluminium plate masts are constructed. These masts are said to be stronger and lighter than extruded aluminium masts, although as yet no comparisons of strength have been found. Carbon masts began to be used in the early 90's, initially in the America's cup and Admirals cup yachts. In the decade since their first use carbon fibre is still not as widely used as one might think. Through the use of carbon fibre a mast can be manufactured which is lighter and stiffer than an aluminium mast. This can significantly improve the performance of the rig. There are 2 main manufacturing methods employed in the construction of a carbon mast. The first is to use a standard section mould to produce a uniform section throughout the length of the mast. This is the cheapest type of carbon mast as the moulds used to make the standard section can be used more than once. They can be built as "one-offs" for a particular yacht. This type is more expensive since a mould has to be constructed to the specifications of the mast, this mould can usually only be used once. The main problem with carbon is the additional cost of the materials and the increased labour involved. A typical carbon mast will be approximately 7 times the cost of an aluminium mast. Through the use of modern computer technology, such as CFD (computational fluid dynamics) and FEA (Finite element analysis) the precise loads on the mast can be calculated. Therefore a carbon mast can be built with increased strength in the direction of the principle loads. For optimum sail shape the bend of the mast is very important, it flattens the sail, since a carbon mast can be manufactured with precisely controlled orientation of fibres it is possible to create a mast which has the correct bending characteristics. This is an important advance in technology, complement this with new sail technology and they form a superior aerodynamic shape that could ever be achieved with an aluminium mast and polyester sails. The use of CFD can also determine the flow around the mast and on the more powerful programs the interaction of the sails and the standing rigging can also be taken into account. Carbon fibre is an extremely well suited material for the manufacture of masts. It offers high strength with low weight, complex shapes can be produced and they have also proven to be reliable. There have been problems with carbon masts recently. The development of carbon masts for IACC yachts have shown that when a carbon mast fails (usually due to under engineering the mast or failure of another rig component leading to the failure of the mast) splinters of carbon fibre are produced and can cause harm to the crew or the boat. It is difficult to compare like for like in masts. This is because the strength on the mast is largely dependant on the second moment of area of the mast section. Since the 3 mast materials will use different section shapes it is hard to compare. The other main consideration of mast material is the amount of windage induced by the mast. This windage can be reduced through a combination of reducing the width of the mast and making it a more aerodynamic shape. This is easy to achieve with carbon as the strength of the mast section is easier to create with different second moments of are fore and aft and sideways. Greatest strength and stiffness is required in the side direction and less is required fore and aft. This means that for a wooden mast there is going to be a surplus amount of wood in the fore and aft direction, which in turn means increased weight. Since the introduction of Carbon masts there has been little further work done on alternative materials. There is however continuous development in the design of the masts to get the most out of the material. Further developments in masts could come from the use of new matrix materials and new fibres. Fibres such as PBO could be used to increase the properties of the mast. The properties of any composite material can be greatly improved through the use of better, more advanced manufacturing methods. The most obvious being the use of an autoclave, which consolidates the laminate much better, resulting in a stronger lighter laminate. Un-stayed rigs have been around for many years, the most successful examples of these are the Laser I and the Topper dinghies, which were developed in the 70's. They have very simple easy to handle rigs. The benefit of a rig such as this is that there is reduced parasitic drag due to the lack of shrouds and stays. The main company, which manufactures this type of rig commercially, is Aerorig. This type of rig is confined mostly to cruising yachts and is rarely found aboard a racing yacht. This is due to a number of reasons, the most obvious being the simplicity of the rig, which does not provide for a good enough test of sailing skill. This factor however does mean that it is well-suited rig for a cruising yacht. Fig 1 shows the largest un-stayed rig manufactured to date, the mast is 60m tall (197ft). The benefits for this vessel is that the rig is well balanced and can be handled by a single person. The technological advances in materials and new understanding of how composite materials behave under load have been crucial in the developments of these rigs. The first noticeable fixed wing rig is to be found on the water speed record boat Yellow Pages. History of Sailing Yacht Masts, Rigging and Sails: 1900-Present Day by James Gilliam.